Celmisias (New Zealand Daisies) are perhaps the best known of New Zealand's alpine flora. They range from robust clumps of strap-shaped leaves to dwarf alpines. 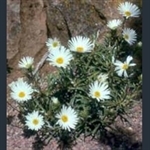 Most have softly hairy, grey foliage, and all have white, yellow-centred daisy flowers. Daisy flowers with white rays and pale yellow disc florets.